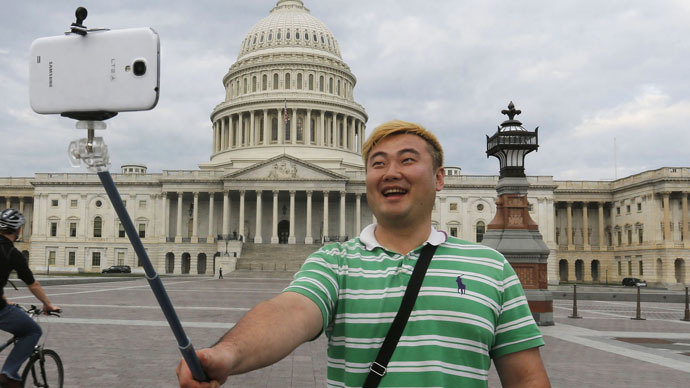 You’d better stay away from men who take too many selfies, a new study warns. Obsession with posting online photos probably points to a higher than average degree of narcissism and psychopathy. Before arriving at the conclusion, an Ohio State University research team surveyed 800 men from 18 to 40, asking them to describe their photo posting habits. The men also had to complete questionnaires about anti-social behavior. Those survey participants who confessed to posting more online images of themselves scored higher than the rest on scales of anti-social traits, including narcissism, psychopathy and self-objectification (valuing appearance above all else). “It’s not surprising that men who post a lot of selfies and spend more time editing them are more narcissistic, but this is the first time it has actually been confirmed in a study,” said Jesse Fox, lead author of the study and Assistant Professor of Communication at Ohio State University. Fox carried out the study together with Margaret Rooney, a graduate student. Their research was published in the Personality and Individual Differences journal. They were looking not only into how often men post selfies, but also into how exactly they are doing it – with or without editing. READ MORE: Facebook AI ‘mediator’ will analyze every upload…to warn against drunk selfies? Cropping and filtering images appears to be a good sign, as it’s not something a psychopath would likely do. “That makes sense because psychopathy is characterized by impulsivity. They are going to snap the photos and put them online right away. They want to see themselves. They don’t want to spend time editing,” Fox said. Self-objectification – being too much concerned with one’s looks - is mostly considered a female issue. Selfie-posting men, however, seem to be joining the club. Fox has promised a follow-up study focusing on women. She expects similar results to those in the male part of the study, but a still higher degree of self-objectification among female selfie-addicts.